Recently, Funcom started teasing their next big release, with a shot of some people at a bar, drinking their videogame troubles away. The game that was being teased has now been revealed: Mutant Year Zero: Road to Eden. Based on the Mutant series of tabletop RPGs, it’s being developed by Bearded Ladies and published by Funcom, and it’s coming out some time this year. In case this has got you in the mood for some XCOM, here’s our guide to the XCOM 2 expansion, War of the Chosen, and everything you should know about it. The game itself is very much using the XCOM formula for its combat, and while there’s not been much gameplay footage shown off yet, a few screenshots show off what will be very familiar to any XCOM fans. What little gameplay footage has been shown comes from the Mutant Year Zero: Road to Eden website, where there’s a short video showing off the game outside of combat. 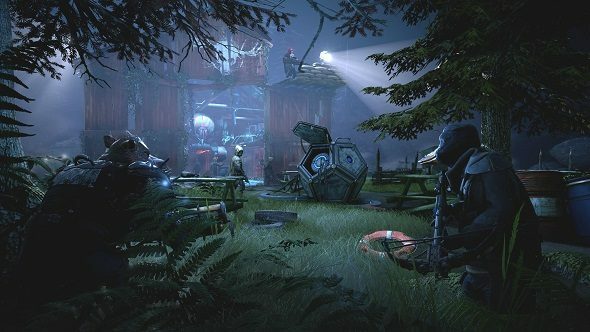 The screenshots show off XCOM combat, while the short video on the Mutant Year Zero: Road to Eden website shows off how the game works outside of combat, and how engagements work. When you’re not fighting enemies, it’s a real-time exploration and stealth game, where you’ve got avoid getting the attention of enemies, lest you be drawn in to a firefight. The story isn’t entirely clear, but the principle of the Mutant series of tabletop games is that the world has ended, and you’re trying to survive in a “post-human Earth,” which explains why one of the characters is a duck. The first gameplay demo is going to be shown next month, at GDC, behind closed doors. It’s likely that soon after, the public should get more of a glimpse at quite how the game plays.